Located 16 km / 10 miles north-west of the downtown area, Lima's Jorge Chavez International Airport is the main gateway to Peru and stands next to Antares, Callao, Condevilla Senor and La Taboada. The airport's single terminal handles all departures and arrivals and is conveniently separated into international and domestic zones. With annual passenger figures over 12 million, several major airlines at Lima Airport operate services to 16 principal destinations throughout South America, as well as offering services to over 20 destinations in North America, Europe and beyond. Recently awarded the prestigious title of 'Best Airport in South America', Lima Jorge Chavez Airport's main airlines include LAN Peru (Latin American Network), Grupo TACA (Transportes Aéreos del Continente Americano) and Star Peru. Lima International Airport is linked to the downtown area by Elmer Faucet Avenue and several buses operate services along this route into the city, while local minivans are available for the more adventurous. Passengers requiring a more comfortable ride can catch a taxi and these are available next to the Arrivals Hall. Alternatively, you can arrange a pick-up from one of the many hotels in the area. The main areas within the city itself include the historic Lima district (Enclosed Lima), the cultural Pueblo Libre area, the upscale San Isidro and Miraflores neighbourhoods, and the beachfront community of Barranco, which is known for its Bohemian atmosphere and romance. 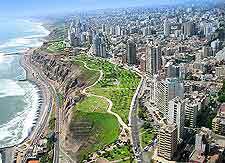 Lima, the capital of Peru, is a vibrant city nestled between the Pacific Ocean and the foothills of the Andes Mountains. A number of appealing beaches are scattered around the coastline, with the most popular including the Punta Negra, the Punta Hermosa and the Santa Maria del Mar. The busy Lima Callao Jorge Chavez Airport (LIM) has long been the main gateway to Peru's top tourist attractions of Machu Picchu, Lake Titicaca and the Amazon jungle. Visitors should look out for the historical centre of the city, which has recently been declared a UNESCO World Heritage Site due to the abundance of Spanish colonial buildings.